FRP (Fiber Reinforced Plastics) is very useful for body parts on almost all types of vehicles and transportation structures. For reinforced plastics we normally use fiberglass, carbon or aramid (Kevlar) fiber because of its strength, insulating properties and general versatility. BPAB is a reliable and quality-conscious subcontractor to the automotive industry, but we also custom manufacture parts and spare parts for other industries within the transportation sector which demand strong and lightweight components that might otherwise be difficult or expensive to obtain elsewhere. We undertake special constructions in small batches for miscellaneous reinforced thermosetting plastic components, such as pipes, air vents, screens, spoilers, etc. If you are renovating vintage vehicles, and finding it difficult to source original spares, we can probably produce the parts you need to complete the construction. Within soon we've made a new, highly durable, part for you. 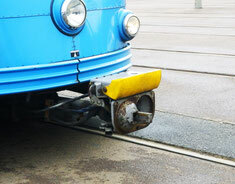 BPAB has manufactured those yellow clutch-pads for the Gothenburg city-trams. These protection covers are built in fiber reinforced polymer and designed for many years of operations wear and tear. The Rescue Cocoon is the ideal vehicle for difficult terrains – flexible, light and strong. It is e.g. used for transporting of material to crash sites as well as transporting injured persons to safety. The vehicle is used by Swedish mountain rescuers during winter and is equipped with a stretcher and space enough for a paramedic. The Rescue Cocoon can be pulled by snowmobiles or all-terrain vehicles. The body is made of fiberglass and fitted with a sprung skid, but can also be fitted with wheels. The Rescue Cocoon is also suitable as a warm cabin for fishing, hunting, nature excursions, work in the forest, etc. 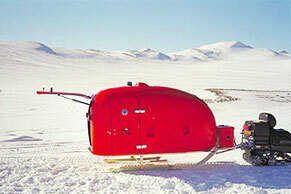 With wheels mounted, the Rescue Cocoon can be used as a mini-mobile home and pulled by a motorcycle. Overnight accommodation for two people. This product is just an example of what BPAB can produce. It was made in a limited edition and can no longer be manufactured because the molds have been sold off.